Experience the best of serene country living and convenient city location with the new homes for sale at Granger Pines in Conroe, TX. Living in Granger Pines will be like living in your own personal retreat. Acres of preserved open space, natural creeks, walking trails, green space, and pocket parks cultivate a relaxed and welcoming atmosphere for residents. Granger Pines is conveniently located near shopping and entertainment, with planned retail located within the community and dining and entertainment options of Valley Ranch Town Center, downtown Conroe, and The Woodlands Market Street are just a short drive away. 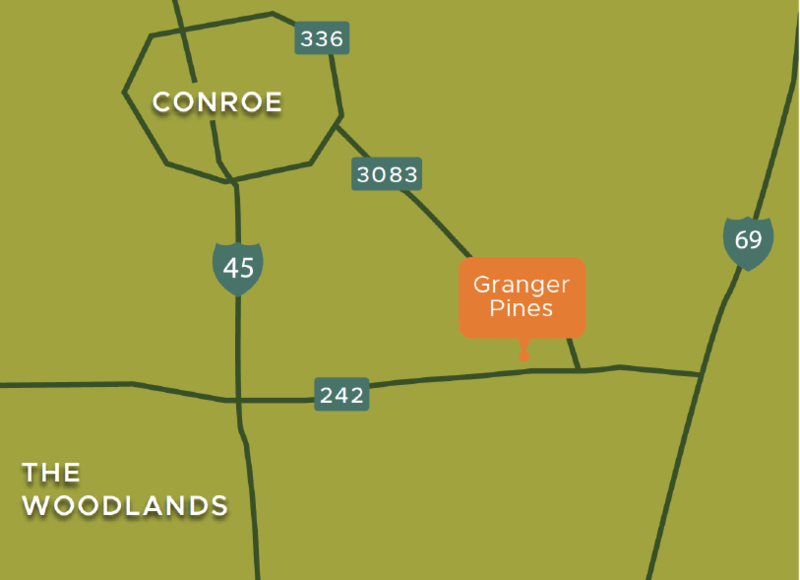 Perfect for families, the new homes at Granger Pines are located in the acclaimed Conroe ISD with 18 acres under contract with the district for a new elementary school within the community. New homes in our Conroe community will be built by well-known Houston home builders, to be announced soon, with attractive floor plan designs available to fit a variety of budgets and styles. Give your family the lifestyle that you deserve! Come home to Granger Pines. Want to learn about life in Granger Pines? Grand Opening is set for October 2019. Join our interest list and be the first to hear the latest news! © 2019 Granger Pines. All Rights Reserved.